Green tea is considered as the best health drink that you can ever have and it is also a natural drink. Many people are now making it a habit to take green tea instead of normal tea and coffee. It is said to rejuvenate you and reduce the level of cholesterol in your body. The anti-oxidant properties of green is said to have great effect in reducing wrinkles, and other symptoms of ageing and make you look young. It also increases the activities of your nervous system and makes you more alert. Your memory power is also increased by drinking green tea. When you get older, it protects you from memory loss and reduces the risks of Alzheimer’s and Parkinson’s diseases. 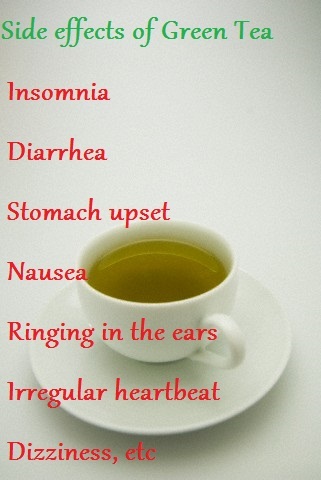 Although green tea has a lot of benefits, it has some side effects as well. These side effects are seen in people who drink too much of green tea, like 4 to 6 cups a day. If you have it within the limits, you are safe from these side effects. When you hear the word caffeine, the image that comes to your mind is that of coffee. Most people think that caffeine is found only in coffee and try to avoid it. But this is not true. Green tea also contains caffeine, but lesser in quantity than coffee or any of its other counterparts. If you drink too much of green tea, say more than three to five times a day, you may suffer from various health problems, like insomnia, diarrhea, stomach upset, nausea, ringing in the ears, irregular heartbeat, dizziness and also the tendency to urinating frequently in some people. So if you are drinking too much of green tea and you are suffering from such symptoms, it is time that you reduce the intake of green tea. Always use it in moderate amounts if you want to get the advantages of drinking green tea. When you are fasting, you must never have green tea as it may be toxic to your body. It can cause various toxicities like renal, liver and gastrointestinal toxicities. The test that green tea is toxic when you are fasting was done only on animals so far, but even human beings are believed to suffer from similar symptoms if taken in empty stomach. Most of the people are under the misconception that when you take green tea when you are fasting, it can supply your body with the essential nutrients that you get from the normal diet. But it is time that you change your this belief and avoid taking green tea when fasting. If green tea is taken in empty stomach, before you have your meals, it will increase stomach acids, which may lead to stomach aches, constipation or a feeling of nausea. So, always take it between meals or after you had your meals. You must also never drink green tea if it contains any ingredient that may be allergic to you. Some of the medicines that you take may also interact with green tea and cause various health problems. So, if you have a habit of drinking green tea, you must consult your doctor before taking any medicines. Wafarin is such a medicine. This is because green tea contains a slight amount of vitamin K. So, if you take anticoagulant drugs like warfarin, you must avoid taking green tea as it makes these drugs less effective. Green tea is very popular for its healing abilities and is often known as the ‘miracle herb’, which has great healing powers and anticancer properties. But ironically, it is said to block the effectiveness of the drug called bortezomib, which is used to fight against cancer. This is because of the presence of polyphenols in green tea, which are said to have lots of healing properties. If you have a habit of drinking too much of green tea, your body will suffer from iron deficiency. This is due to the presence of tannins in green tea, which prevent the body from absorbing iron from food and iron supplements. If you prefer to drink green tea with your meals and you suffer from iron deficiency anemia, the doctor advices you consume food that is rich in iron like red meat, meat and foods that are rich in vitamin C like oranges and lemons. Pregnancy and lactating times are delicate times and you must be careful that you take food that are good for your health, which have no side effects. If you drink too much of green tea during theses times, it may increase the risk of miscarriage and also cause a number of other health problems. So, you must be particular about drinking green tea and should not have more than 2 cups of green tea daily. You may even stop taking green tea during such times to prevent any problems related with it. Lactating women should also reduce the intake of green tea or completely avoid it as the caffeine contained in it may pass into the breast milk and then pass into the body of the infant, affecting the baby. Another side effect of green tea is that it may cause osteoporosis. When you drink too much of green tea, the amount of calcium flushed out in the urine is increased. As a result, your body suffers from calcium deficiency, which may affect the bones and cause various problems like osteoporosis. So, you have to compensate it by having calcium supplements. So, you can see that green tea is good for your health, but too much of it can cause a number of health problems as well. You must always drink green tea in moderate amounts and enjoy its benefits.